Up until it was abolished in the summer of 2014, one of the unique peculiarities of Italian football was the co-ownership system where a player could be owned jointly by two teams. It seemed strange from the outside looking in but it was actually an arrangement that worked well for decades. It gave smaller clubs access to some funds when they sold part of a player’s rights whilst at the same time allowing them to retain the services of that player. For the bigger club, on the other hand, it provided an opportunity to tie down a player in whom they were interested; keeping an eye on him to see how he developed. Eventually however, each of the two clubs would have to decide what to do with their half of the deal. Often they would find an agreement but, occasionally, they didn’t. When this happened they went to what was known as “buste” (envelopes), a blind auction where each party wrote down how much they were ready to pay for the other’s half with the highest bidder winning. As with any such auction, there was a huge element of risk involved where a valued player might be let go for too little or bought for too much. For the neutral, it was a fascinating way to resolve a stalemate whilst, for those involved, it became a game of trying to second-guess what the others were going to do. Secrecy, as a result, was of utmost importance. Which is why, when Giussy Farina received a call midway through the summer of 1978, he was delighted. In the previous year his club Lanerossi Vicenza had been one of the most exciting sides in the Serie A, pushing Juventus all the way before settling for second place. 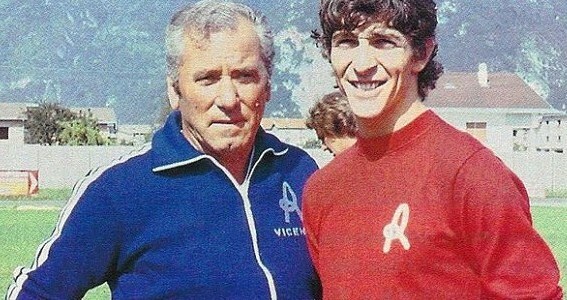 Farina was desperate to keep the team together and in particular he was desperate to keep hold of star striker Paolo Rossi. The only problem was that Juventus, who owned the other half of the player’s contract, were just as desperate to sign him and with no agreement being reached it led to the usual blind auction. And that is when he received the anonymous phonecall informing him that Juventus were willing to pay around two and a half billion Italian lire (around €1,000,000). Boosted by this knowledge, Farina put a figure that was slightly above that amount and, true to form, won the right to keep the striker. Afterwards, when curiosity kicked in, he snatched a look at what Juventus had offered and to his shock he found that their bid was around a quarter of the sum that he had put forward: he had been had. Worse than that, the deal put a huge financial strain on the club. Whilst Rossi’s future had been secured other key players had to be sold in order for Vicenza to try and stay afloat. Thus came to an end one of the most remarkable stories in Italian football, one that should have lasted for much longer and brought much richer rewards to the man who had brought it all about: Giovann Battista Fabri. After a stay in the Serie A that had lasted twenty years, Vicenza had fallen to the Serie B in 1974-75 and then went perilously close to demotion to the Serie C. Change was needed and the demanding home fans clamoured for some big signing to be brought in. Instead, they were given Fabbri who was the antithesis of all that they were expecting; a coach who couldn’t care less about a player’s reputation and whose work was based around the strength of the team rather than that of the individual. Nor did the players brought in show signs that the club’s ambition matched that of the fans. Winger Francesco Cerilli had been a failure at Inter, midfielder Giancarlo Salvi was 31 when he signed whilst young striker Paolo Rossi was a Juventus reject who had failed to make an impact when sent on loan to Como. In the light of all this, it was difficult to fault the fans’ apprehension. Fabbri was, however, a different kind of manager. By the time he was put in charge at Vicenza he’d already managed half a dozen clubs but his biggest claim to fame was that of launching the career of a young midfielder by the name of Fabio Capello. Beyond that, he’d developed a style of play that for 1970s Italy was very much counter-cultural. This was the heyday of catenaccio where every team deployed variations of the ultra-defensive tactics that had brought so much success to Helenio Herrera at Inter. Not Fabbri, however. For him the model was Ajax and Holland’s Total Football. In his teams, full-backs were expected to press forward and act in support the lone striker. Players weren’t pigeonholed and were expected to fill in a number of positions within the system shifting according to the demands of the game. His past failures had come about through a combination of owners who were unwilling to tolerate his attacking instincts and others who wanted to dictate the teams that went out on the pitch. His hope was that at Vicenza he would be allowed to play in the manner that he wanted without too much interference. Whatever his wishes, however, his job was immediately at risk after Vicenza lost 2-0 against Avellino on the opening day of the new season. The fans’ protests increased a notch after that in the hope that they would force the club into making a change. Thankfully for them, that didn’t happen. Three consecutive wins put them on the right track and Vicenza never looked back, playing an innovative brand of attacking football whose fluidity increased the more players became familiar with it. To top it all up Paolo Rossi, around whom there had been so much doubt at the beginning of the season, scored twenty one goals earning him a call up to the Italy U21 side. For all the positives of their promotion season, however, the immediate impact with the Serie A wasn’t a happy one. They picked up just two points from their first five games without registering a win. Going into the sixth game – a trip to Atalanta – Fabbri knew that his job was at risk. Perhaps that is was brought about a change in attitude. Up till that point Fabbri had tried to tweak his tactics to be a little bit more cautious; to be as conservative as others were in Italy. Yet, when that wasn’t working and with little at stake, he opted for a return to cavalier style his team had adopted the previous year. The impact was instantaneous. Vicenza won 4-2 in Bergamo and went on to win their next three games as well, scoring thirteen goals in the process. By the twelfth game, Vicenza were on sixteen points, just one behind leaders Juventus and AC Milan. It was a fantastic run that captured the public’s imagination. Here was a provincial side that was not only going against all expectations but was doing so by playing an exciting brand of football, all this with a squad full of other clubs’ rejects. So good was Fabbri’s team that it was quickly nicknamed Real Vicenza, in honour of the all-conquering Real Madrid side of a couple of decades earlier. Vicenza’s season came to a close in Turin with a game against a Juventus side in celebratory mood having already wrapped up the title. Vicenza however, weren’t willing to join in with the festivities and wanted to cap off a fantastic second place finish in style. Juventus twice went ahead but on each occasion they were pegged back until, finally, Bettega scored the decisive goal for the Turin side. The Vicenza player singled out for praise from that game – just as had happened for most of the season – was Rossi. The young man who had once struggled at Como had excelled, beating his previous season’s record by scoring twenty four goals. Fabbri’s philosophy and style of play had proven to be ideal for him whilst he, in turn, had shown great footballing intelligence to fit in so brilliantly. His reward was a place in the squad for the Argentina World Cup which, whilst ultimately a disappointment for the Italians, was still a fantastic achievement for someone playing at such a small club. Juventus, having experienced first-hand Paolo Rossi’s goalscoring instincts, decided that they wanted him back. Thus began the to-and-fro between the two sides that ultimately ended with Vicenza retaining their player but at a price that greatly exceeded their budget. That is how Farina justified the transfer that he believed would cement’s Vicenza’s position at the top but which, in truth, was the one that would spell their ruin. As had happened elsewhere in his career, Fabbri’s reputation for doing well with the players provided had resulted in greatly exaggerated expectations; people simply assumed that he could do well regardless of which players he had available. So it was that two important player – Lelj (Fiorentina) and Filippi (Napoli) – were sold to finance the Rossi deal without suitable replacements being brought in. Making matters worse was an injury to Rossi early in the season that further kneecapped the team which, rather than battle it out for the title, suddenly found itself fighting against relegation. By the eight game of the season they were bottom of the league and only the return of their talismanic striker that helped them climb out of danger. Not completely however and four consecutive defeats in the latter part of the season pushed them back into the relegation mix. On the final day of the season they travelled to Bergamo where the previous season’s turnaround had started. This time round, however, there was neither the energy nor willingness to fight, and they were easily beaten by Atalanta. A year after coming so close to winning the league, Vicenza were back in the Serie B. They would never have it so good again (even though they would win the Coppa Italia a couple of decades later). Neither would Fabbri. His next job was at Ascoli whom he led to a fifth place finish in the Serie A – which to this day remains their best ever finish - but that relegation with Vicenza had heightened the distrust in the kind of all-action attacking football that he championed. Few were willing to take such risks and when his next three jobs (Cesena, Reggiana and Catania) all resulted in relegation his fate was sealed. Time would prove that he had been a visionary, someone who had managed to see where football was heading well before anyone else had any inkling. Yet, as often happens with such visionaries, his genius was rarely recognised in his lifetime. Fabbri kept on coaching but more often than not he was put in charge of hopeless cases where there was little material for him to really make an impact. He would, however, have a final hurrah. Appointed technical direct at Spal, his hometown club, he oversaw back-to-back promotions that saw them rise from the Serie C2 to the Serie B. It would turn out to be his final stop in football in a career that had spanned half a century; a final moment of glory in a career that deserved much more of them.